Lyon Village: Developing An Air of Exclusivity? Its cute houses and immediate access to Clarendon’s many offerings have made Lyon Village one of the more attractive Arlington neighborhoods in which to live over the last few years. But little by little, the community’s character—as well as a number of its smaller houses—could be fading away, as well-heeled new residents tear down existing structures to build homes more to their liking. Though Lyon Village still feels like a friendly, tight-knit neighborhood, it may be developing an air of exclusivity. Lyon Village lies inside a curve of I-66, bordered by Lee Highway to the north, Kirkwood Road to the west, Wilson Boulevard to the south, and North Veitch Street to the east. While Lyon Village is an entirely residential neighborhood, most sections are within a few minutes walk of the Whole Foods, Apple Store, funky independent boutiques, and burgeoning restaurant scene of Clarendon’s commercial district. That means evening and weekend outings can occur wholly on foot. For those who work in downtown DC or want to hang out in the city, the trip is about eight minutes via Metro’s Orange Line, and two stations, Clarendon and Courthouse, anchor the neighborhood. For drivers, the area is also close to some of northern Virginia’s most convenient highways, including I-66 and Route 50. But the crowning point of Lyon Village’s location is that it’s not bisected by a single busy road or commercial area, and as a result, is quiet, cozy, and very pedestrian friendly. Mac, a 59 year-old media producer, described himself as having “totally lucked out” more than thirty years ago, when he bought his Lyon Village home for less than $50,000; its current value is more than ten times that. He said that a neighbor recently put her house on the market with an asking price of $800,000, thinking she’d have to eventually lower the price. 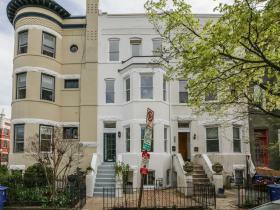 Rather, there was a bidding war, and the home ended up selling for more than $1 million. Laura Rubinchuk Schwartz, an agent with Keller Williams Realty, provided statistics that back up these anecdotes. She told UrbanTurf that the average home has three or four bedrooms and costs around $1 million. Prices for smaller houses tend to start at around $600,000, but that the area’s largest properties can sell for upwards of $2 million. The houses west of North Highland Street tend to be fairly large with spacious yards, but the eastern side of Lyon Village is dotted with fairly simple bungalows and Cape Cods, which sit on smallish plots of land. 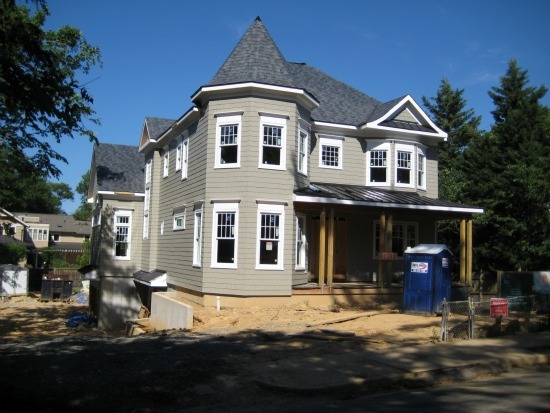 However, the neighborhood has seen an increasing number of cases in which buyers knock down the existing home that they have purchased and construct an entirely new one in its place. It’s not a very common phenomenon—Schwartz estimated that out of the neighborhood’s 600-some homes, only 30 or 40 are brand new—but it’s enough to be noticeable. 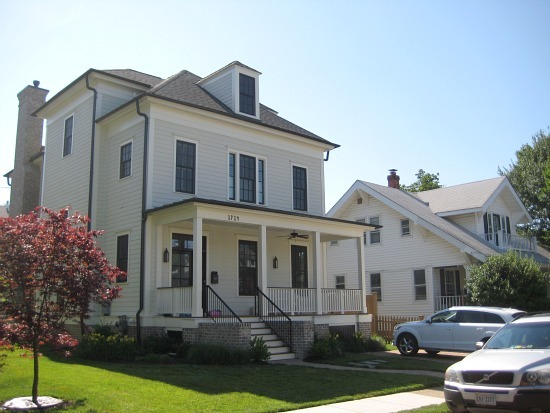 Mac pointed out three new homes on his block alone. However, most of these properties are not your typical McMansions, but rather well-built craftsman-style homes that fit into the existing fabric of the community fairly well. They may be towering over tiny lots, but often, viewing the houses from the side is the only way to see how large they really are. George Ruppert, a 40-year resident who was watering the flowers within a traffic circle recently, pointed to the house being constructed next door to his; he’d heard it would be more than 6,000 square feet. But he didn’t seem to mind living next door to a behemoth, noting that “a lot of people have put on additions [to their homes],” including himself. There are a number of condo and apartment buildings just off of Wilson Boulevard that are relatively affordable and technically within the neighborhood’s borders, but they’re largely viewed as an extension of Clarendon. The only multi-unit building considered part of Lyon Village is the Residences at Lyon Hill; another complex, Lyon Pointe, is currently under construction. Both are high-end, luxury condo buildings with units starting at $600,000 and going up to $1 million. Mac divided current residents of Lyon Village into two categories: long-timers who arrived several decades ago, back when much of the neighborhood had a seedy flavor and homes were relatively cheap; and newcomers largely consisting of two-income households who are able to afford a house in the neighborhood through family money or a windfall earned during the real estate boom. For newcomers, Lyon Village offers many pros and few cons. The Arlington County’s schools are some of the best in the region. Crime is almost non-existent and the community is watched over by an active citizens’ association. 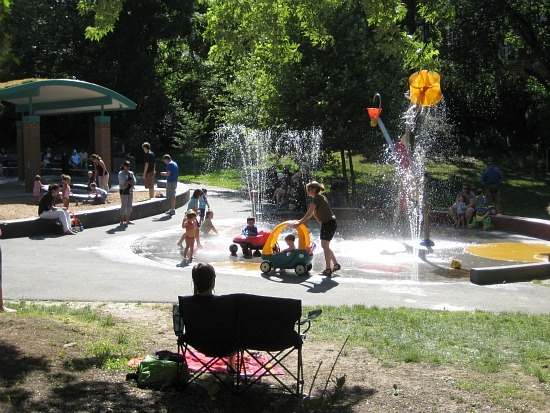 The neighborhood is home to several parks, including Lyon Village Park, which boasts a range of jungle gyms and climbing structures, plus a water feature that’s a hit with children. The Lyon Village community also collectively owns a building, the Lyon Village Community House, that hosts classes and events. And, as noted above, it does not have a commercial strip, but is very close to one. However, all these advantages can have a downside. According to Brodbeck, the editor of ARLnow.com, there have been complaints from neighbors that Lyon Village is becoming overly exclusive, and he noted the distinct possibility that the area’s population is becoming more upscale. Evidence of this can be seen in a parking and traffic issue that arose in April. The county has discussed the possibility of ending zone parking on one side of the street for some roads in the neighborhood to allow emergency vehicles to operate more safely. But Lyon Village residents have responded with indignation, and many have agitated for more zone parking and better traffic calming devices in order to keep outsiders out. Lyon Village seems like a storybook small town — a place where neighbors are friendly, services are within walking distance, and crime is a distant concern. All of that is true, but these days it comes with a price tag. Like so many DC-area neighborhoods, the community is shifting from a low-key neighborhood of engaged professionals to one that’s distinctly higher end and off limits to those without serious means. I live on the Hill and it reminds of the convenience of having just about everything you need around you. Amidst the chaos of the Metro area it's good to have neighborhoods like this one. Unfortunately it's becoming exclusive but that's what happens when you find a gem like this area, people are willing to pay a premium. Lyon Village never became "seedy." In the 80s, a few streets closer to Lee Hwy and Courthouse had a few older, smaller homes that had seen better days, but Lyon village was always one of Arlington's more upscale neighborhoods, especially west of Highland St, and it closely resembles some neighborhoods in upper NW that were built around the same time. 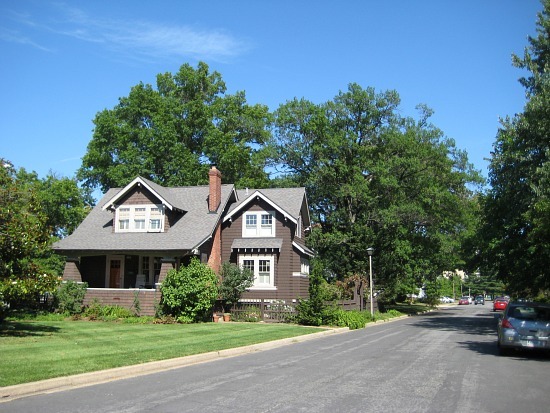 Lyon Village was always upper-middle class and had larger homes than nearby neighborhoods of the same period like Ashton Hts and Lyon Park; but now, as the article states, it is becoming "overly exclusive." And a correction: Taylor Elementary is the neighborhood school for the western half of Lyon Village, not Key. Boundary maps are on the Arlington Public School's website. Enjoyed the article! Here is a video tour of Lyon Village http://www.youtube.com/watch?v=JsP91hXc3do&feature=youtu.be.